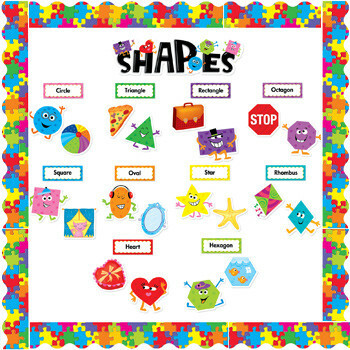 Classroom Display Resources | Shapes Bulletin Set with Border. Free Delivery. Use the fun pictures and labels of this bulletin board set to teach about the 10 most commonly found shapes with a variety of concepts. Helps to reinforce basic early-childhood skills, and enhance vocabulary development. Shape size approx. 13.5 x 16 cm.